On the post, the first thing is a picture. The plugin is displaying the code of the picture. BETTER: is there a way to have the <extract> been displayed? This way it would avoid this situation? tag page - http://theplanetfixer.org/tags/....try the singapuoe tag. I could reproduce the issue on my test site using latest version of Global Site Tags plugin that the shortcodes are displayed in the post excerpt on the tags page displayed by this plugin. I have notified the plugin developer about this so that it can be fixed. It will be fixed ASAP. 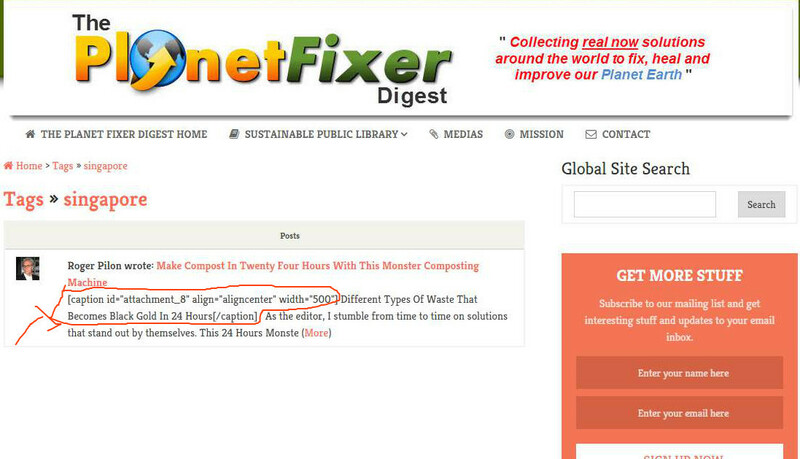 In the meanwhile to fix the issue try editing the following Global Site Tags plugin file on line number 406 as below.